The Lawmate RD30 Camera Detector has a very simple to use lens finder which works even when a camera is switched off. It also has a built in wireless scanner that can detect wireless audio and video signals being transmitted on frequencies between 20MHz – 6GHz. It’s powered by AAA batteries and comes with a pack of 3. Extremely small, light and portable -weighing in at just 74g (without the batteries). So if you’re worried that there could be a spy device located in your home or workplace then this camera detector with wireless scanning functionality is an easy to use tool to put your mind at rest. 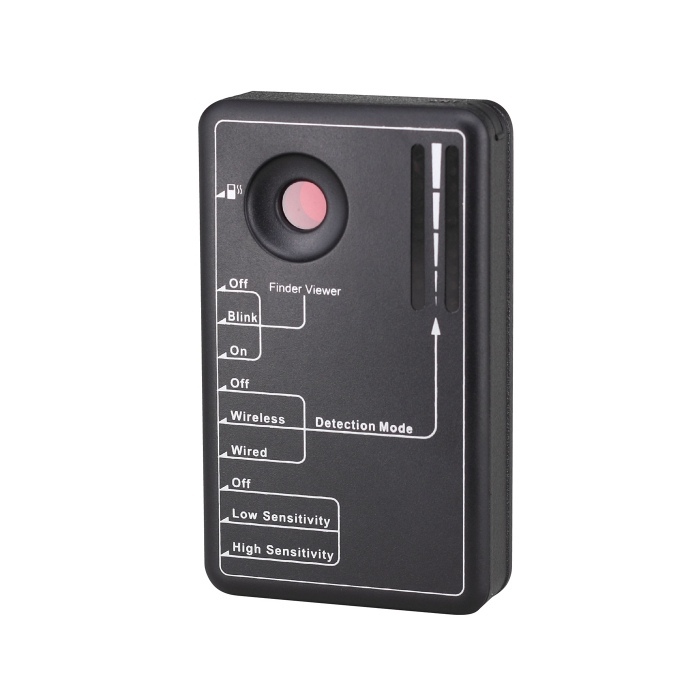 The camera detector is very simple to use: on the back of the detector, you will find a viewer with red LED lights that flash intermittently. Looking through the eyepiece, you can see anything that reflects light back to you. If there is a hidden wired or wireless spy camera, even if it’s got a tiny pinhole lens as many of them do, it will reflect light back to you and you can easily locate the hidden camera source even if the camera is powered off!